The gift of balloons and chocolates is always a wonderful gift to receive and a sure way to make someone feel special. Hand delivered to the recipient's home or office. Balloons & Chocolates-4 Mylar is a hand delivered gift. These gifts are delivered by one of our local design centers located throughout the United States and Canada. Same day delivery is available for most gifts when ordered before the cutoff time. The cutoff time for Balloons & Chocolates-4 Mylar is 2 PM in the recipient's time zone. This is the first time I used your company. I wanted to be sure my granddaughter received her balloons on time. I also worried about the cold weather and the balloons deflating if no one was home to receive balloons. I need no worry because everything was perfect. The balloons were in interesting shapes and colors. Ordered it late the night before delivery. It arrived on time and was very fun. Looks like you might have substituted candies for chocolate, but that was not a problem. Everyone enjoyed it. My grandson broke his collarbone and this was a wonderful "get well" gift for him! He was really happy and excited to get this gift! Ordering was quick and easy. Delivery was sameday as ordered and delivery confirmation was quick. What impressed me even more was I ordered this for someone struggling with chemo. The fulfilling party took the time to read the sentiments in the card and picked out the perfect balloons for the situation. I was told the recipient was brought to tears and smiles at the same time. Thanks so much!! Thrilling experience and wonderful service!! My 89 year old Father was thrilled to receive balloons and chocolates for his birthday. He was very surprised and it was so much better than sending flowers for a man. It was an easy way to send a gift. Ordered and delivered as requested. This is a great service, well-executed, and the price is reasonable. A wonderful alternative to flowers when you want a surprise for someone far away. We were very impressed by the service and turn around time for delivery. The recipient was very pleased with the gift and enjoyed it very much. We would use this vendor again. Price was very reasonable. The arrangement was wonderful and arrived on time! Thanks so much! The balloons and chocolates arrived when requested and the whole family loved them. Well done! Made my boyfriends birthday really special. We are in a long distance relationship and I couldnt make it to him for his birthday. So being able to send him something that didn't drain my bank account was awesome. This site really made it easy to send a gift! I will be recommending this site to friends! Had a balloon bouquet and chocolates sent to my sister for her 70th birthday. She was very pleased. Thank you! When someone is rehabbing sometimes it seems like they might be in for EVER. Cards of encouragement are fun, but it's nice to go all out - something for others to ask about, something to share with the nurses - just a happy way to brighten up what might be the day they need it the most. The balloons were awesome *from what my sister told me* the chocolates were ok. Nothing to fancy and not crap chocolates either. The whole arrangement was done to perfection. I had a note saying to sing a cat song that I provided but due to my incompetent sister not being at her dorm at the time she said she would be, the song was not delivered. 10/10 would order again. Wished they had a time of delivery open option. I would pay extra to have the items delivered at a specific hour. Delivery worked perfectly - my daughter was delighted to receive balloons and Chocolates. Really made her birthday away from home a special occasion. Thanks! I recently bought this gift and was pretty pleased with the fast service and the quality of the items. I must say that the service charge is what influenced me not to give this a five star rating because i believe that it is just too high. But other than that everything was great. My granddaughter was so excited to receive the colorful gift . The balloon bouquet was beautiful and the delivery was very prompt. I called they delivered same day. Arrangement was fantastic. I would order again. arrived in a timely manner, was perfect for the occasion. I addd a package of cookies to the order, these were a big hit. I WAS VERY PLEASED WITH THIS CUSTOMER AND WOULD RECOMMEND TO ANYONE. MY BROTHER HAD 1 DAY SURGERY AND I DIDN'T KNOW WHAT TIME HE WOULD BE GOING HOME. 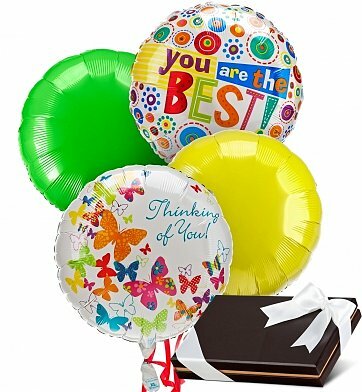 SO I FOUND THIS COMPANY ON THE INTERNET PLACED THE ORDER WITHIN 30 MINUTES THE BALLOONS AND CHOCOLATES WERE THERE! I got to work on Monday morning and realized I forgot to arrange for something to be delivered to my husband at work for his birthday (that day!). I had never used this site before, but they offered same day delivery at a reasonable cost. The balloons and candy were delivered by early afternoon and my husband was surprised. He eventually brought them home and almost 3 weeks later the balloons still have their helium! My order is as it seen on the web site thanks for that. Sent for my nephew having emergency surgery, delivery as promised and quickly....flowers and latex balloons not allowed by hospital so this was a perfect "pick me up", "thinking of you" with "well wishes" was perfect. My wife loved the balloons and chocolate box! They came right on time and in perfect shape. Never too old for this. This was the best idea. My boyfriend was totally surprised and his family was jealous they didn't get one from their loved ones. I immediately got photos of him with his balloons with a smile a mile wide. I will definitely be considering this kind of gift for him and maybe others in the future.